The Helen Hartness Flanders Ballad Collection (HHFBC), one of the important holdings in Special Collections, is one of the nation’s great archival collections of New England folksong, folklore, and balladry. It was the life’s work of Helen Hartness Flanders (1890-1972), of Springfield, Vermont, donated to the College by Flanders herself in 1941. The collection consists of field recordings collected over the course of thirty years by Flanders (daughter of a former Vermont Governor and wife of Ralph Flanders, a Vermont Senator from 1946-1959), who worked to preserve Vermont traditional folk music on the Committee on Traditions and Ideals of the Vermont Commission on Country Life. 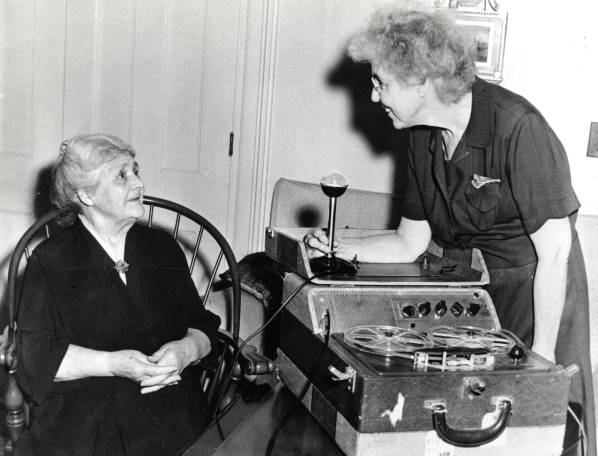 Helen Hartness Flanders (r) recording Mrs. John. N. Fairbanks of Springfield, Vt. The collection consists of over 4,800 field recordings preserved in various formats. These etched wax cylinders and aluminum disks, reel-to-reel tapes and tiny songbooks, when juxtaposed with instant-streaming Spotify playlists and Internet-famous stars, hardly seem like they would have any spot in modernity. In fact, some of the materials in the collection are unplayable due to extinct technology and decomposing formats, yet these very obstacles have inspired the implementation of new technologies to access and preserve the historical relics. One such innovation, IRENE 3/D, uses digital imaging to capture the grooves of wax cylinders and discs and render their recordings audible. In 2014, Middlebury participated in a federal digitization grant awarded to the Northeast Document Conservation Center that utilized the IRENE technology, capturing sound from broken and cracked wax cylinders and records which made it possible to play ballads not heard for over 80 years. With the music in the collection available in digital format, the next step was making it accessible to researchers. 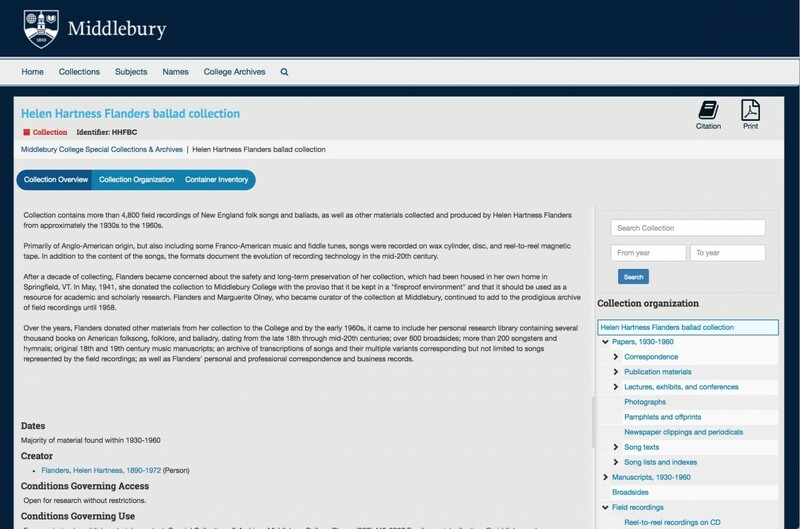 When Special Collections launched their presence on the Internet Archive, the HHFBC was one of the first collections uploaded. Sound recordings, broadsides, and photographs are all searchable and downloadable from the repository, allowing researchers to explore the collection without setting foot in the reading room. The most recent technological update to the collection, however, inspires physical interaction with the collection. In addition to browsing digitized materials from the collection on the Internet Archive, researchers can now access the full inventory of materials in the collection through ArchivesSpace. Though Special Collections launched their presence on the site way back in July 2016, the HHFBC’s finding aids were added just last month, providing an online overview of the myriad facets of the collection, thus providing those who prefer hands-on research with a full map of the holdings. Two such researchers are Anna Roberts-Gevalt and Elizabeth LaPrelle, the two folk musicians who make up the duo Anna & Elizabeth. After many hours spent in Middlebury’s Special Collections, the Vermont Folklife Center, and other archives across the east coast, the pair has released a new album, The Invisible Comes to Us, inspired by old songs, some of which were only accessible thanks to Flanders and the preservation of her collection. The track “Black Eyed Susan,” for example, was inspired by a recording made by Flanders in 1940. Listen to Lena Bourne Fish singing “Black-Eyed Susan” on the Internet Archive and compare it to the Anna & Elizabeth interpretation from their new album. The album is described by Smithsonian Folkways record label as “breathing life and new perspective into the crackling and disintegrating recordings and artifacts of the past. Rarely does an album based on traditional folk music resonate so strongly in modern times.” Anna & Elizabeth returned to Middlebury to perform music from the album at the Champlain Valley Unitarian Universalist Society to benefit the Vermont Folklife Center on April 21st. Come visit Special Collections from 1pm-5pm Monday-Friday, or by appointment, to experience the HHFBC firsthand.